This definitive, lavishly illustrated book from National Geographic features an astonishing array of vintage and newly created maps, rare photographs, covert documents, and eyewitness accounts that illuminate the world’s greatest conflict. 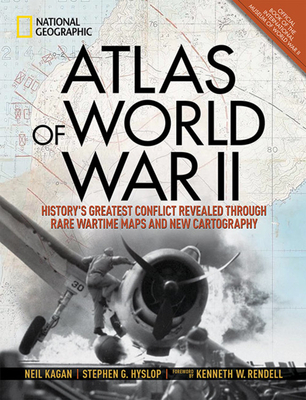 This magnificent atlas delves into the cartographic history of WWII: naval, land, and aerial attacks from the invasion of Poland to Pearl Harbor and the Battle of the Bulge. Rare maps include a detailed Germany & Approaches map used by Allied forces in the final stages of the war, full large-scale wartime maps of the world used by President Roosevelt, and crucial Pacific theater maps used by B-17 pilots. Satellite data renders terrain as never before seen, highlighting countries and continents in stunning detail to include the towns, cities, provinces and transportation roads for a pinpoint-accurate depiction of army movements and alliances. Gripping wartime stories from these hallowed fields of battle, along with photographs, sketches, confidential documents, and artifacts color the rest of this timeless and informative book. NEIL KAGAN, editor, heads Kagan & Associates, Inc., a firm specializing in designing and producing innovative illustrated books. Recently, he edited Great Photographs of World War II, Smithsonian Civil War, and for National Geographic, as well as the best-selling Concise History of the World, Eyewitness to the Civil War, Atlas of the Civil War, The Untold Civil War, Eyewitness to World War II and The Secret History of World War II. Author STEPHEN G. HYSLOP has written several books on American history, including National Geographic's The Secret History of World War II, Eyewitness to World War II, Eyewitness to the Civil War, and The Old West. His articles have appeared in American History, World War II, and the History Channel Magazine. Consultant KENNETH W. RENDELL is the founder and director of the International Museum of World War II, which houses the world's most comprehensive collection of original artifacts and documents relating to the causes, events, and consequences of World War II.